NASHVILLE, Tenn.—January 9th–Country and gospel music icons the Gaither Vocal Band, The Gatlin Brothers and The Oak Ridge Boys recently joined together for a special LIVE recording of classic hits and timeless gospel favorites. The three GRAMMY®, CMA, ACM and GMA DOVE Award-winning artists reflected on their gospel music roots and influences, performed some of their most popular songs and combined harmonies for numerous once-in-a-lifetime collaborations. The event resulted in two CD and DVD collections entitled Country Roots and Gospel Favorites and A Few Good Men, hosted by ASCAP Songwriter of the Century Bill Gaither. The sing-along was recorded at Gaither Music Group’s Studio C, known as the setting for many Gaither HOMECOMING video tapings over the past three decades. 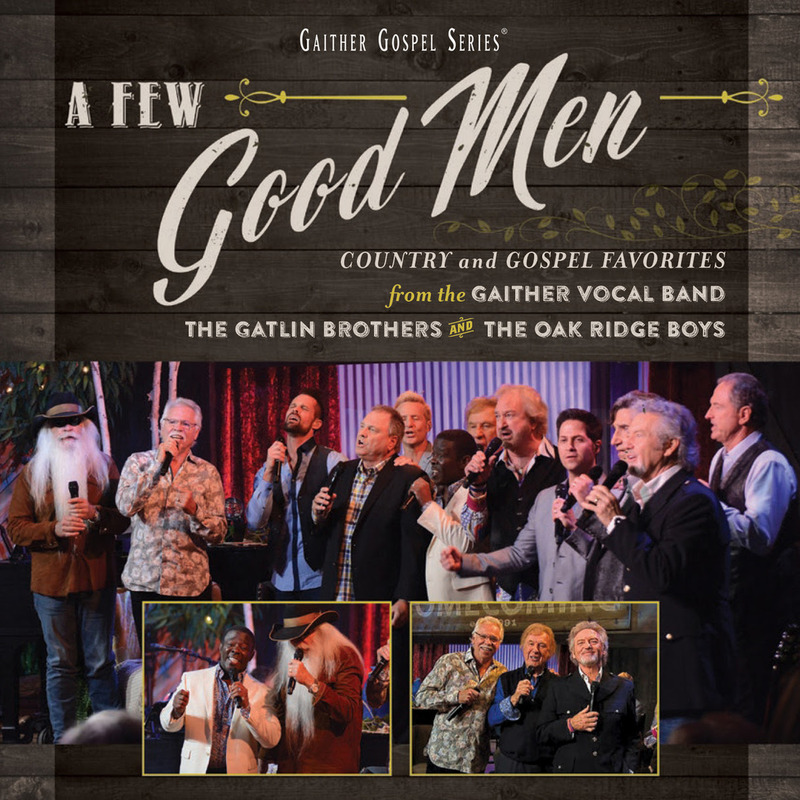 In addition to popular songs from three of the most recognized groups in country and gospel music, the DVDs feature a visit inside the Gaither Hall of Honor with Gaither, Larry Gatlin and Oak Ridge Boy Joe Bonsall. These music legends–members of the Country Music Hall of Fame, Gospel Music Hall of Fame and The Grand Ole Opry–reminisced about their longtime friendships, shared memories from all-night singings at the legendary Stamps Music School and discussed the importance of gospel music in their lives throughout their careers. Full of emotion and camaraderie, these recordings highlight The Oaks Ridge Boys’ unmistakable four-part harmony, the compelling arrangements of the Gaither Vocal Band and the soothing family blends of The Gatlin Brothers. Fans will enjoy inspiring stories, anecdotes and hits such as “He Touched Me,” “Thank God for Kids,” “All the Gold in California,” “Loving God, Loving Each Other,” “Elvira,” “I’d Rather Have Jesus,” “Houston (Means I’m One Day Closer to You),” “Chain Breaker” and more. The three groups are each touring nationally in 2018. Country Roots and Gospel Favorites and A Few Good Men will premiere as a TV special on RFD-TV on January 18th, January 20th, January 25th and January 27th. The special will also air on a large number of networks including PBS, DirecTV, Dish TV, AT&T U-verse, TBN, GaitherTV, FamilyNet, CTN, GMC, GMTN, Guardian, Liberty, TCT and TLN. In Canada it will air on Vision TV, The Miracle Channel, CTS and Hope TV. The releases will be promoted via RFD-TV’s web properties and social media, RFD-TV Magazine, the Gaither Spring Catalog, the Gaither Music Group web site, label and artist social media campaigns, the Gaither TV YouTube page and SIRIUS XM’s enLighten Channel. The DVD and CD recordings are exclusively distributed by Capitol Christian Distribution and Universal Music and will be available on January 26th, throughout general market stores and the Christian marketplace in addition to online retailers including iTunes, Amazon and Gaither.com. It is currently available for pre-sale at Amazon.com, Christianbook.com, LifeWay.com and Gaither.com. The top-selling Gaither HOMECOMING Series, known worldwide for its TV specials and arena tours, has become a household name among gospel music lovers since its early days when the concerts featured such legendary artists as Jake Hess, Vestal and Howard Goodman, George Younce, Glen Payne, Dottie Rambo, Hovie Lister and many more gospel music mainstays.